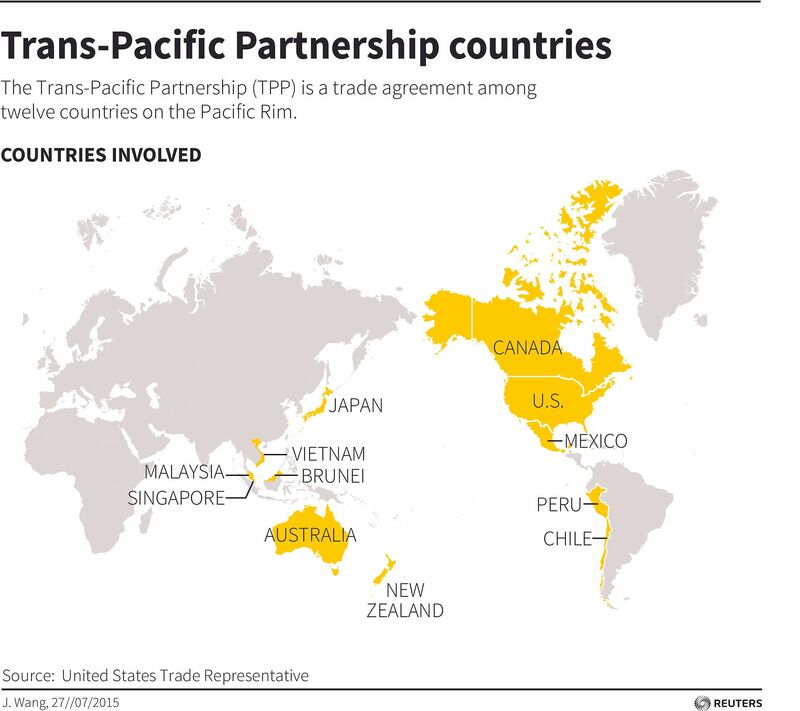 Five long years and 32 rounds of negotiations finally yielded a breakthrough, as 12 countries - including Singapore - thrashed out the landmark Trans-Pacific Partnership (TPP) trade deal. The deal, which was sealed on Monday (Oct 5), involves nations which make up nearly two-fifths of the world's economy, have a total population of 800 million and churn out a combined GDP worth US$30 trillion (S$42.7 trillion). It traces its roots to the Trans-Pacific Strategic Economic Partnership, dubbed the Pacific 4 (P4) agreement, of May 2006 between Singapore, Brunei, Chile and New Zealand. In 2008, the United States, Australia and Peru indicated their interest in negotiating a free trade agreement (FTA) with the P4. This FTA became known as the TPP. Here are five highlights from the pact. Others will have reduced tariffs. For the US alone, taxes will be eliminated on more than 18,000 of its products. Canada is also set to grant "limited new access to its tightly controlled dairy and poultry market - TPP members will have duty-free access to 3.25 per cent of the country's diary market, and 2.1 per cent of its chicken market. On the sidelines, a quartet of countries - the US, Mexico, Canda and Japan - have hammered out a deal with rules to govern autotrade that dictate how much of a vehicle must be made within the TPP region to qualify for duty-free status. The current agreement calls for 45 per cent of an automobile to comprise parts sourced from TPP membersin order to be eligible for beneficial tariff rates. Reports said that the final round of negotiations was difficult as it hinged on a major point of contention - how long a monopoly period should be allowed on next-generation biotech drugs. The TPP partners were unable to settle on the minimum period of protection to the rights for data used to make such drugs, which are usually monopolised by major firms such as Pfizer Inc and Japan's Takeda Pharmaceutical Company. The period of exclusivity was eventually set to at least five years - lower than the 12-year window demanded by US companies. The pact also includes measures to safeguard the drugs from generic variants. The partners will sign a pledge not to devalue their country's currencies to make their exports cheaper. This is in line with a commitment to have a higher standard with regard to their exchange rate policies, and to avoid using their currency to promote competitive devaluation. It is a move seen as reassuring the US Congress, which is worried about countries such as Japan engaging in exchange rate manipulation. For instance, US carmakers are concerned that a weak yen gives its Japanese competitors an advantage in the market. Under the pledge, TPP members will need to reveal more about their currency practices and policies. An annual meeting will also be held to disccuss currency issues. All 12 TPP partners agreed to effectively enforce their environmental laws; and not to weaken them in order to encourage trade or investment. They also concurred on several hot button environmental topics, such as promoting sustainable forest management, protecting the marine environment from ship pollution and committing to cooperate on matters of common interest, including in the area of conservation. As for labour issues, they agreed to eliminate forced labour in their own countries and will not waive or derogate from laws implenting fundamental labour rights in order to attract trade or investment. The TTP is set to become the largest pact governing global commerce in history, tut the end is not yet in sight for its members. The pact must still pass through the hands of lawmakers in the respective countries, some of whom face fierce opposition from critics. If the US Congress ratifies the deal - and that's still an "if" - it would be a major achievement for President Barack Obama, but the earliest that could happen will have to be early next year, with Congress having at least 90 days to review it. Meanhile, China, with the world's second-biggest economy, stands to lose out the most as it did not join the TPP. 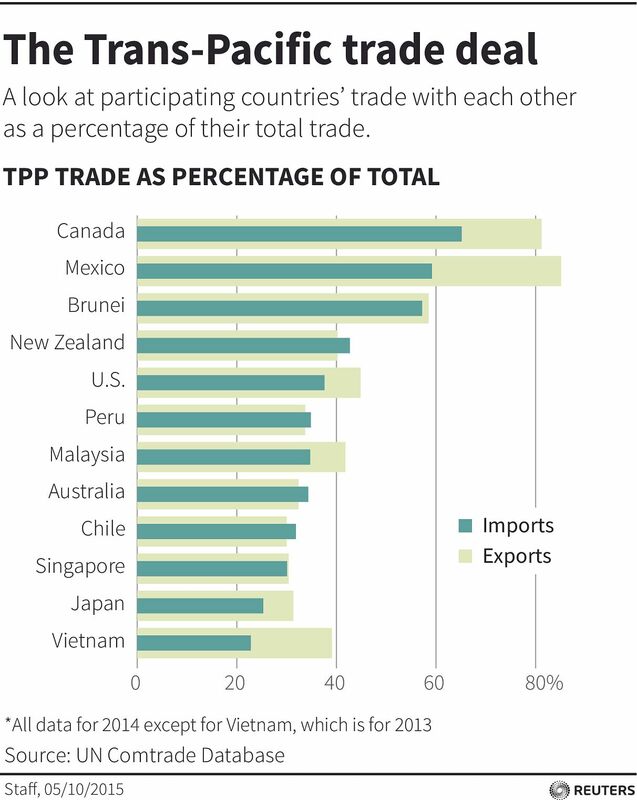 Chinese exporters stand to lose some of their market share to developing TPP members such as Vietnam.